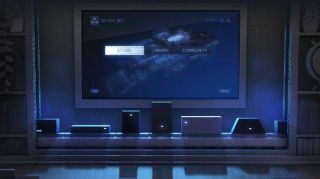 The second of Valve's trio of announcements this week has landed - Steam machines: hardware from a wide range of manufacturers that runs SteamOS. "Entertainment is not a one-size-fits-all world," the company said in its announcement. "We want you to be able to choose the hardware that makes sense for you, so we are working with multiple partners to bring a variety of Steam gaming machines." It works like this: Valve makes its new SteamOS software available for free, then anyone in the world (including you) can build a machine that runs it and sell it to someone else. The manufacturer (or you) profits by selling the hardware, Valve profits by selling games on the platform, the person who buys it profits by trading some useless numbers in their bank account for some entertaining videogames. Everyone's happy. What's notable, though, is that Valve is making its own bit of hardware too. A "prototype", the company calls it, which it'll be shipping to 300 lucky Steam users worldwide while approximately 53,999,700 unlucky Steam users weep into their Mountain Dew and write angry comments on games websites about how they should have been chosen instead. But there's something interesting going on here. Valve is opting for exactly the same strategy that Google did when it released Android, almost five years ago to the day, in 2008. Google's aim mirrored Valve's - open source software that any hardware manufacturer could use. The manufacturer profits from selling the hardware, Google profits by selling apps and media to people who buy that hardware, and the user profits by trading some useless numbers in their bank account for some entertaining apps and media. Everyone's happy. Google even put together its own prototype, too. The HTC Dream, better-known in some places as the G1, was the first Android smartphone to be released - designed by Google and built by HTC. Despite being in many ways inferior to the first iPhone which was released about a year before the G1, Google's handset gave manufacturers an example of the best way to build an Android device. Many of its features are now standard on other Android devices - the touchscreen, a minimalist approach to physical buttons, and a 3.5mm headphone jack - while others fell by the wayside. Physical keyboards, for example, are rarely seen today. But with the G1, Google showcased consumer demand and showed manufacturers that had struggled for years to build a usable smartphone the way forward. Does this cat know what the future holds for Steam Machines? History, of course, repeats itself. With Valve's prototype (which I'm apparently not supposed to call the "Steam Box"), the company is showcasing consumer demand and showing manufacturers that have struggled for years to build a usable living room PC the way forward. Valve is keen to deflect attention from its prototype. "There will ultimately be several boxes to choose from, with an array of specifications, price, and performance," the company emphasises. "The specific machine we're testing is designed for users who want the most control possible over their hardware. Other boxes will optimize for size, price, quietness, or other factors." But you can bet that Valve's hardware will be in hot demand and other manufacturers will clone it to the best of their abilities. Google's grand experiment with Android has worked like a charm - as of September 2013, there have been one billion Android devices activated. By a happy coincidence, that's about as many PC gamers are estimated to exist, according to the PC Gaming Alliance. Can Valve replicate Google's enormous success with its Android platform? Maybe. Could the same hazards that have hit Android - fragmentation, or awful skins replacing the stock UI - plague SteamOS? Sure. But given past form, would I want to bet against Valve? Not in a million years.